Imagine camping next to an ancient harbor, or conquering a holy summit that has been a site of worship since ancient times. If you are a fan of history and ancient civilizations, Crete will become your favorite destination for yet another reason. The first traces of inhabitation on the island date back to 8000 BC; however, Crete is mainly known as the birthplace of Minoan Civilization, the first civilization on European soil, which flourished between 3000 BC and 1200 BC. 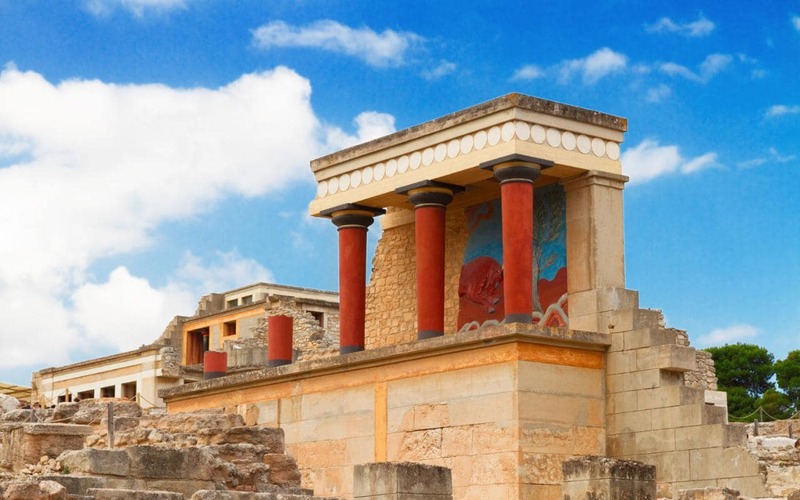 The splendor of Minoan culture is reflected on the imposing palaces of Knossos, Phaistos, Malia, Zakros and the luxurious Minoan villas scattered around the island. At the same time, masterpieces of pottery, sculpture, silversmithing, and the impressive frescoes in Minoan palaces found during archaeological excavations reveal a sophisticated, highly aesthetic civilization. The Minoans had a powerful fleet and dominated the entire Mediterranean. They worshiped the Mother goddess, using as sites of worship caverns and mountain peaks such as Yuchtas, Kofinas (Asterousia) etc. They developed a syllabic script, Linear A and later Linear B, and women had an important place in Minoan society. The decline of Minoan civilization started with a series of natural disasters (earthquakes, tsunami, etc.) followed by the arrival of Greek tribes (Dorians) on the island. Today you can admire some of the most famous Minoan findings at the Archaeological Museum of Heraklion; including the Disc of Phaistos, the Ring of King Minos, the Bee Pendant, the Snake Goddess and the Prince with the Lilies fresco, among others. Finally, don’t skip a visit at the archaeological sites of Knossos, Phaistos, AgiaTriada, Kato Zakros etc. Apart from the Minoan sites and monuments that are found mainly in central and eastern Crete, the island is full of monuments and remains of the many other civilizations that flourished. Throughout its centuries-long history, Crete has accommodated Romans, Arabs, Byzantines, Venetians, Genoese and Ottomans, all of whom left traces of their unique civilization on the island. As you explore Crete, you will also find many archaeological sites and monuments from the classical, Hellenistic and Roman times; such as the impressive archaeological site of Gortyna, Latos and Eleftherna (with the remarkable new museum). Moreover, you will meet beautiful Byzantine temples, dazzling buildings and Venetian fountains, Ottoman monuments and more. Every corner of Crete hides a relic from the island’s long history. Join the treasure hunt and discover as many as you can, while traveling with your LazySnailCampers caravan!